The Ernie Ball Music Man bass earns its place in rock history as a definitive high-output bass guitar that became the choice of rock bands from AC-DC to The Cure. And you can discover why the Ernie Ball Music Man bass makes the grade here on-line or at a Mega Music store. The iconic StingRay, for example, is a serious contender for the bass player looking for a strong and definitive bass tone. Most Ernie Ball Music Man basses are available in 5-string versions and are ready and willing to rock your socks off. Explore and discover your bass tone with a Ernie Ball Music Man bass at Mega Music. The new Cutlass from Sterling by Music Man features 3 vintage single coil pickups, hard maple neck and comfortable 12 inch fingerboard radius for maximum comfort in a modern package. A perfect culmination of old world aesthetics and styling with modern design and playability. The Musicman StingRay is simply a classic bass that has been adored by many and has stood the test of time. Mega nice, mega-output and here for you at Mega Music. A stunning anniversary five-string bass guitar in classic finish with a figured maple neck. 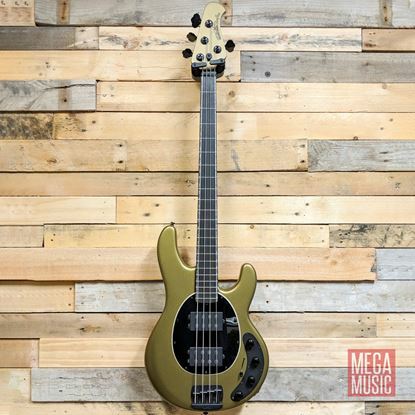 The Music Man Sterling RAY34QM is an extremely well designed bass. Featuring a stunning neptune blue body and maple neck, this bass is visually striking and produces an incredibly warm sound. The Music Man JP150 is a meticulously well designed instrument. Featuring a beautiful Mahogany body, Maple neck and a stunning Sahara Burst finish, this guitar has an incredibly full sound and is set to deliver on stage and in the studio. The BFR StingRay Special 4 HH, a bass built for performance and comfort, is limited to only 98 pieces worldwide.